Colin Kaepernick's collusion charge against the NFL has been tough to prove, until now. If the Houston Texans don't sign him, the league is out of excuses. WASHINGTON — The word “collusion” is pretty popular around these parts these days. Now, evidence of it is mounting in spades against the NFL and its teams in light of their collective refusal to sign a clearly capable quarterback currently on the market while clearly inferior players keep getting contracts. And whether or not there is any evidence on Jerry Jones’ cellphone, none of it matters in light of this: If the Houston Texans don’t sign Colin Kaepernick, the league is out of excuses. As you probably know, Kaepernick filed a grievance against the NFL in October, accusing the league of collusion in not hiring him. Halfway through the NFL season, plenty of teams need quarterback help. And while you could make a case that Kaepernick could be of service to any of them as an upgrade over the incumbent backup — in Green Bay, Arizona, Miami, Tampa Bay, heck, even over a healthy Joe Flacco in Baltimore. The Houston Texans clearly stand out in needing a competent signal-caller to replace injured rookie DeShaun Watson. Here was Houston’s quarterback depth chart coming into the week: Tom Savage, T.J. Yates and Matt McGloin. The Texans have a viable path to the playoffs, given their weak division and soft schedule. They have a chance to salvage their season, to play meaningful games that draw fans to the stadium the rest of the season. Don’t they owe that to the fans who have invested in season tickets? Don’t they owe it to NFL fans everywhere, per their lucrative television contracts? But let’s be clear — they have no chance with the quarterbacks currently on the roster. Maybe Kaepernick could change that. The Texans actually have found success running read option plays through Watson, something that their current quarterbacks are simply not built to do, but something Kaepernick has excelled at. In fact, Kaepernick’s vast experience playing in such a system was one of the primary arguments used against him going into this season. Now, will Kaepernick seamlessly replace Watson? Of course not. But he would give the Texans a better facsimile than anyone currently on the roster, and wouldn’t create any kind of quarterback controversy when Watson is ready to return next year. Tell me some of these formations, motions, routes and execution don’t look familiar. Kaepernick also provides the open-field running ability that only Watson gave the Texans. On Tuesday, the Texans released the Scranton Scrapper and signed … Josh Johnson. Yes, Josh Johnson, the University of San Diego product who has never won an NFL game he has started (0-5) and has thrown twice as many picks (10) as he has touchdowns (five) in his career. The Josh Johnson who has not thrown a pass in the NFL since Dec. 11, 2011, 420 days before Kaepernick took the field in Super Bowl XLVII. The case for Kaepernick over any of these three should not even have to be articulated. 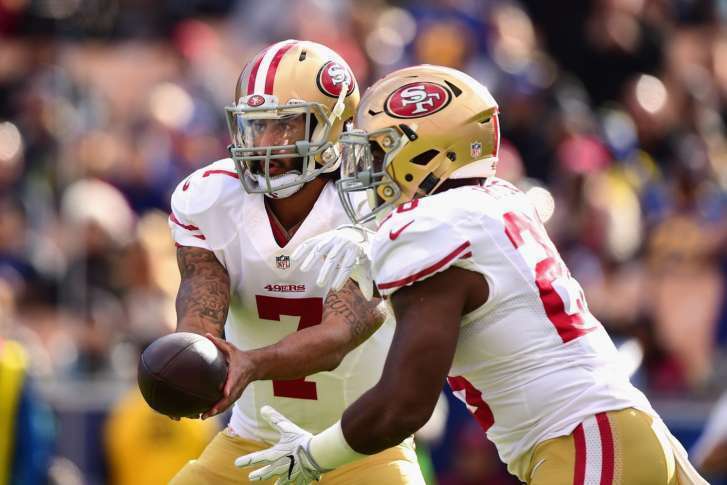 The trio has thrown fewer touchdowns (12) in their combined careers than Kaepernick did last year (16) and as many interceptions (19) as Kaepernick has thrown over the past three seasons despite 500 fewer combined attempts, nearly twice the rate. Even in Kaepernick’s worst season, his quarterback rating (78.5) never dipped close to Yates’ career average (72.8). As for the current starter, Savage, anyone watching last weekend’s Texans loss to Indianapolis — in which they scored seven offensive points against the worst scoring defense in the NFL — can clearly see the talent deficit. Savage finished the day 19-of-44 for 219 yards against a team allowing better than 60 percent passing and nearly 300 yards a game through the air. At least give Savage credit as the only person actually speaking the truth (“I played like crap”) after the loss. Kaepernick obviously wouldn’t be ready to face the Rams this Sunday anyway. But even if that game is a lost cause, the remaining seven contests feature four very winnable contests against .500 or worse teams and two matchups against the teams currently ahead of Houston in the division, each of which have severe flaws. Even the Steelers have dropped a game to the Bears this year. Want to know something funny? As the Merriam-Webster piece linked in the opening sentence of this piece explains, the word “collusion” is derived from the Latin “colludere,” literally a combination of “together” and “to play” — the word actually means “playing together.” But just as the Texans and the NFL have the chance to actually let Kaepernick play, they’re bungling things yet again. Commissioner Roger Goodell did the NFL a great disservice Wednesday, basically scripting a legal point for the plaintiff, by stating publicly that “People come to our stadiums to be entertained and have fun, not to be protested to.” That’s a heck of an admission — a declaration, even — about how the head of the league views the demonstrations that Kaepernick helped initiate. And, yes, I know all about Bob McNair’s statement a couple weeks ago and his players’ reaction to it. But this isn’t the place where I finish with some grand, kumbaya statement about how signing Kaepernick might heal a fractured clubhouse, giving that story some sort of polished, Hollywood ending. The Texans hiring Kaepernick is simply a good business decision. The NFL always tells us that winning is the league’s bottom line. Assuming the city of Houston didn’t ink a blood deal with the devil in exchange for the World Series, the Houston Texans have an obvious chance to win more games by signing Kaepernick. It’s as simple as that. If they don’t, they’ll sign, seal and deliver Kaepernick’s case for him.